Once thought lost early film with a solid supporting role by Boris Karloff pre- Frankenstein. The plot has a crook trying to fix the up coming mayoral election. .When the DA gets evidence of whats going on he's killed and through circumstance, actually the misidentification of an idiot reporter, the daughter of the clean candidate is suspected. Regis Toomey single handedly wrecks an otherwise excellent little thriller. Toomey plays a moron of a reporter who always does and says the wrong thing. While it does help to move the plot along no one could really be that dumb. 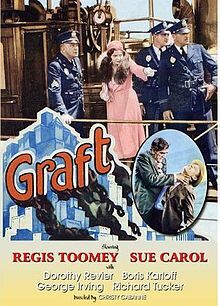 Its an unfortunate thing since other than Toomey this is well acted and well made film with Karloff super as an evil henchman. If you can get past Toomey's moronic behavior (which no doubt was supposed to be funny rather than stupid) you'll enjoy this. I let Toomey's character act in a vacuum and I had a good time. Recommended if you can do the same.